Paraffin (and) Microcristallina Cera. Paracera™ M by Paramelt acts as a consistency factor. It is a microcrystalline wax of ozokerite structure. It is formulated with a well-balanced proportion of straight and branched chain hydrocarbon waxes. It has consistency regulating and gel forming properties. Due to good absorption of mineral and vegetable oils, stable and fine crystals are formed. Its applications include stick products, decorative cosmetics, creams and ointments. It complies with FDA 172.886 and 178.3710. 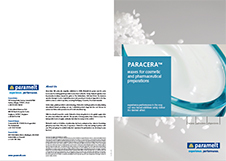 Paracera™ M has a shelf life of at least two years.